"You, the 'Light' ones, the 'kind' ones, who've decided they have a right to protect the world from Darkness. Where were you when they drank my blood? Why can't I do that now?" I have always enjoyed the complex mythologies of the fantasy genre and the amazing worlds created by its prominent figures. The Lord of the Rings, Alien, the original Star Wars tales, and television gems like Stargate SG-1 and Firefly have provided clever, imaginative worlds and great entertainment; not an easy task. A good mythology is hard to construct—just take a look at the two Matrix sequels, which displayed originality but just weren�t fun to watch. This type of difficulty has now appeared in much greater fashion with Night Watch, a much-anticipated Russian hit that crossed the ocean earlier this year. Nightwatch is the first entry from director Tikur Bekmambetov�s ambitious trilogy, which depicts the eternal struggle between the forces of Light and Darkness. Meeting on the battlefield in 1342, the armies decimated each other, which led to an uneasy truce that maintained the balance of power. In modern day, signs have appeared that a new war is about to begin, one which could wreak serious destruction on the human race. The key figures in this battle are the Others, powerful beings unseen to humans that display a wide range of abilities. Some are traditional vampires and desire blood, while others can transform into bears, tigers, and other nasty fighters. The Night Watch protects the light and keeps watch on the evildoers, which Day Watch does the same for the good warriors. This set-up appears to fit perfectly with my geeky tendencies, but the film is a messy, nearly incoherent series of fights that generate more tedium than inspiration. Konstantin Khabensky stars as Anton, a mild-mannered guy who visits a strange old woman for assistance with a vicious action against his unborn child. The resulting chaos changes him forever and transforms him into one of the Others. Twelve years later, Anton�s son could play the key role in the impending war. The early scenes are effective and mysterious, and the woman�s actions are especially creepy. But the momentum quickly lags when we move to the present time. Little is explained, and the filmmaking isn�t interesting enough to keep us involved in the convoluted story. Bekmambetov�s quick-cutting style might appeal to some viewers, but it distracts from the plot and adds to the confusion. When Anton encounters Svetlana, a young doctor who could spark the end of all things, the meeting is awkward and lacks any real weight. Her role does lead to some big special effects, including numerous dark birds and a plane headed for a crash. Sadly, these moments never move beyond eye candy and grow tedious as the story drags toward its clunky finale. This film is the first entry in a three-part trilogy that will continue to expand on the mythology. 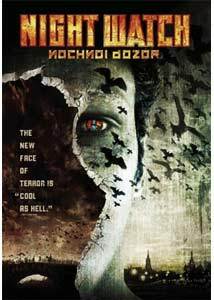 The sequel, Day Watch, was released to Russian audiences in early 2006 and earned the country�s highest box office take since the end of Communism. Dusk Watch, the final installment, will arrive in theaters next year and actually utilize English as its primary language. The series� rampant success is surprising considering its obvious imitation of legendary past classics. However, that similarity could also explain its great popularity. The environment is less polished than comparable Hollywood blockbusters, and the Russian setting is prominent throughout the picture. Also, the story is based on the complex novels by Sergei Lukyanko that may work better prior to the English translation. Night Watch is the type of divisive film that will inspire awe from some and strongly alienate others. I expected to find myself in the first category but was surprised to quickly tire of the gloomy battles. A few memorable moments do occur, including a crazy scene involving a truck executing a 360-degree flip, but they only offer a brief respite from the frustrating plot. Perhaps the sequels will offer greater depth and shed light on these events. This prospect does not appear likely, however. Bekmambetov deserves credit for taking chances and inspiring a legion of fans, but the underwhelming film could have used another edit. If you�re not a diehard fan of vampires and dark themes, I would bypass this picture and seek your urban fantasy fix elsewhere. Image Transfer Review: Night Watch contains many night scenes that could easily offer a high concentration of grain, but the picture usually avoids this. The 1.85:1 anamorphic widescreen transfer does include some minor grain, but it fails to detract too much from the overall presentation. The image has solid black levels and bright enough colors to depict the story, though the final product falls short of premier DVD releases. Audio Transfer Review: This release includes a solid 5.1-channel Dolby Digital transfer for both the English and Russian language versions. Blaring heavy metal songs support much of the action, and few quiet moments exist. This gives the audio plenty of chances to shine, and for the most part it succeeds. It falls short of offering tremendous complexity, but the violent battles only need so much help to generate energy. Extras Review: The Nightwatch bonus features are split onto two sides, with the best inclusions appearing on Side B, which houses the Russian version. This side includes a feature-length audio commentary with co-writer/director Timor Bekmambetov, who speaks candidly about his creation. His English is easily understandable, and the information provided sheds considerable light on the confusing story. The second commentary is a subtitle track from author Sergei Lukyanenko, the writer of the source novels. His material is even better and provides compelling explanations of the fantasy elements. He also is willing to discuss areas where his vision differed from the finished product. Especially interesting on this side are the English subtitles, which are imbedded into the picture and supported by clever visual effects. They increase in size during the crazier moments and enhance the energy of the film. This is the first time that I've viewed these type of unique subtitles, and it really does improve the viewing experience. Side A includes a collection of mostly insignificant extras, with a few brief exceptions. The first is The Roof, an extended ending that runs for more than six minutes. Bekmambetov offers optional commentary on this scene, which adds more exposition but fails to improve the original conclusion. The other notable entry is Night Watch Trilogy�a three-minute look at the sequel Day Watch and the director's plans for the entire trilogy. The information is worthwhile, but it should have been much longer. The remaining supplements include a pointless teaser trailer for The Omen disguised as a Fox "Inside Look" and previews for The Hills Have Eyes, Broken Saints, and Thief. This release of Night Watch is significantly shorter than the original Russian version and includes numerous changes by Fox Searchlight for the international audience. These revisions include the addition of more voiceover narration and flashbacks, as well as the deletion of several storylines. I am unable to compare the two versions, but can state that this version could have used a few more minutes. It delivers a frustrating viewing experience that shows considerable promise but falls short of warranting a recommendation.